the slogan of our new outdoor showroom for sailing and motor yachts is both a proclamation and a promise. We would like to invite you to spend a relaxing day here with us in Roermond. Enjoy the extraordinary atmosphere on the water and tour our permanent boat exhibition. Allow our experienced team to show you the latest offers and benefits at the Boulevard Nautique Roermond. Following your visit, you may want to explore the beautiful city centre or the well-known Designer Outlet Roermond located within walking distance. Register here on our website and we will always keep you up to date on our news and events. Online or on site – it is always worth paying us a visit. 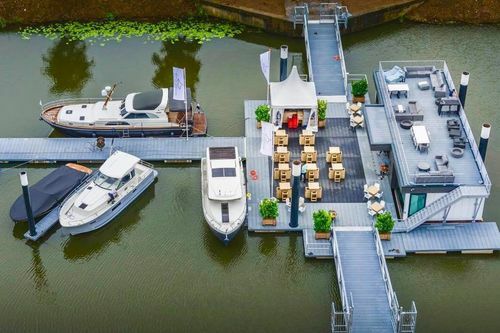 Boulevard Nautique Roermond is a marina-style outdoor showroom with berths for up to 30 sport, sailing and motor yachts. You will find an exclusive selection of new boats and young secondhand yachts. Boatyards and small manufacturing companies have placed the best yachts from their inventories at our location. Prospective buyers can tour and experience the yachts at their leisure: the marina has direct access to the Meuse River, making extended sea trials under real conditions possible. There are several reasons for visiting the Boulevard Nautique when you are looking to buy a new yacht. As you embark on the adventure of a boat, we would like to be there for you from day one to give you any help and advice you may need. However, not only prospective buyers are more than welcome here. Our very competent team will also be happy to facilitate the sale of your boat. Many years of experience on this market have taught us what really matters when selling boats. You can rest assured that we will only offer you boats that are in perfect condition and at fair prices. We are a reliable partner of established boatyards from all over Europe. As such, we not only share the same high standards when it comes to the maintenance and care of boats, but this close cooperation also means that we can find the right solution for all of your considerations. Take a look around on our boating page. You will find that this professional platform offers numerous pictures, technical detail and any other information you may need. The Boulevard Nautique Roermond is located within walking distance of the Designer Outlet Roermond, Europe’s largest outlet with over 200 exclusive designer shops that draw 6 million visitors each year. Roermond is also worth a visit: situated in the province of Limburg, Roermond is known for its picturesque historic city and Meuse Lakes recreational area. These picturesque surroundings, which have something to offer every taste, are also home to the Boulevard Nautique Roermond. 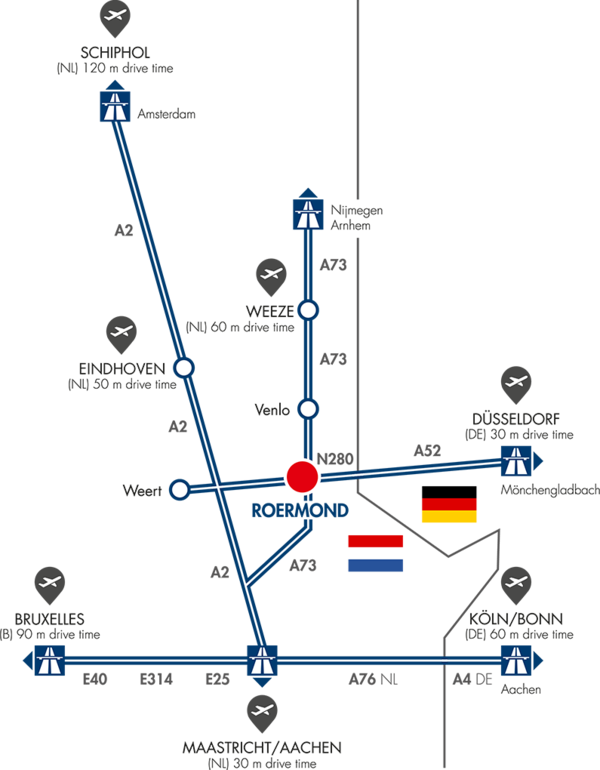 The Boulevard Nautique Roermond can easily be reached by car, train and plane.